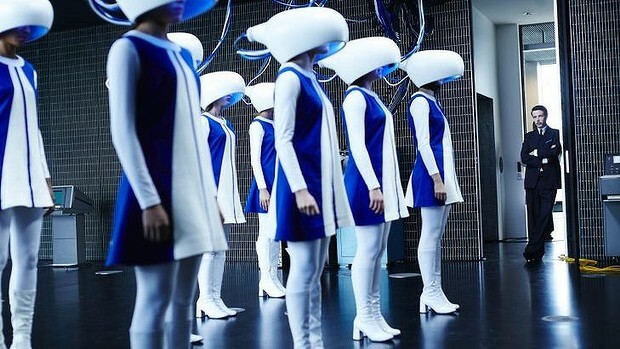 Based on “All You Zombies,” a short story by sci-fi legend Robert A. Heinlein (Stranger In A Strange Land, Starship Troopers), Predestination– which comes out on Blu Ray and DVD February 10– is a time travel mind-bender that’s guaranteed to throw you for a loop. 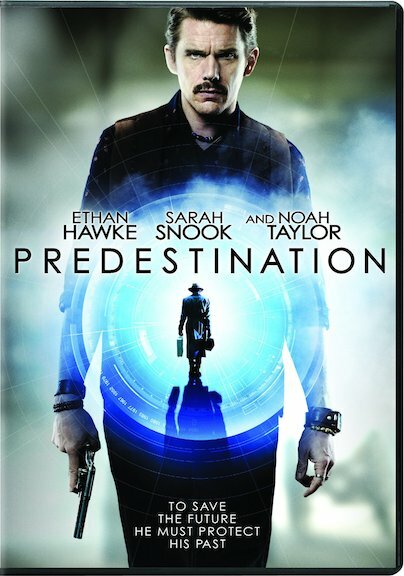 Ethan Hawke stars as an agent working for a shadowy government organization, the Temporal Bureau. Using a time machine disguised as a violin case, he’s sent back to stop a terrorist known as the Fizzle Bomber and prevent a devastating 1975 attack that kills 11,000 people. He stops the NYC bombing, but is severely disfigured as a result. Cut to a Big Apple dive in the ‘70s, where the agent is a bartender pouring drinks for a quirky customer who writes for True Confessions magazine under a pseudonym, “The Unmarried Mother.” The customer bets the bartender a bottle of whiskey that he can tell the most remarkable story he’s ever heard, and proceeds to do so. He was originally identified as a she at birth, abandoned at an orphanage, and raised as a girl named Jane (Sarah Snook). Smart, tough and inarguably different from the other girls, Jane tries to become an astronaut in the Space Corps. She excels at every test until the physical, which reveals that Jane is anatomically very different from her peers, and she’s disqualified without explanation. Eventually she goes to night school in Cleveland, where she falls for and becomes pregnant by an older man, and eventually gives birth. During the delivery, we learn why she was dismissed by Space Corps: Jane was born with both male and female reproductive organs. With the latter irreparably damaged during childbirth, doctors externalize her male genitalia and remove her ovaries just as an unknown male snatches her baby from the hospital nursery. Devastated, Jane gradually becomes John. After John finishes his traumatic tale, the bartender reveals that he knows the identity of the man who ruined Jane’s life. They travel back in time, where John is given a gun and encouraged to kill the mystery man. We can’t tell you what happens next without ruining the ending, but suffice it to say that the climactic reveal is a head-scratcher in more ways than one. Directed by German brothers Michael and Peter Spierig (Daybreakers), this Australian indie is as original and unpredictable as it is confusing. Visually it’s spellbinding, but its twists and turns of time travel logic require serious suspension of disbelief and a willingness to just go along for the weird, wild ride. It’s mind-blowingly bizarre, and definitely the most original story we’ve seen in quite some time.